PENCILLER: Salvador Larroca. Cover by Adi Granov. It captures its main character perfectly. It sprinkles in just enough prequel material to display Vader’s depth, but not turn die-hards off. It has added new characters that add both intrigue and humor. It’s also beautifully drawn, and does enough artistic justice to the classic Star Wars visuals that when it adds something new (For instance: A secret base on top of what can only be called “space whales.”), it’s that much easier to buy it as a part of this iconic universe. 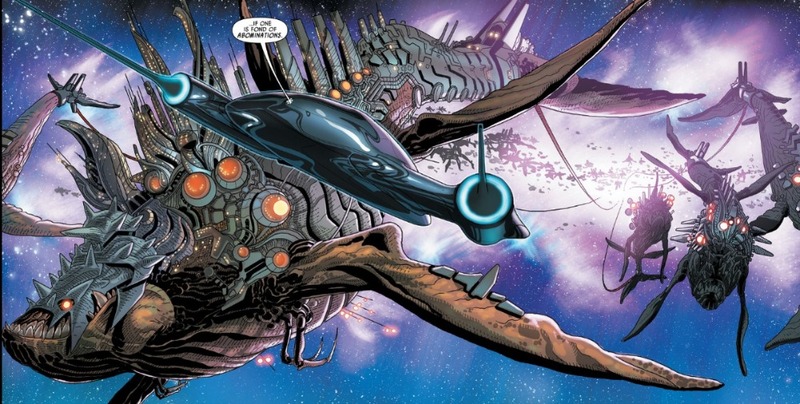 On the subject of visuals, that two-page shot of the space-whales is amazing. It’s like nothing we’ve ever seen in a Star Wars movie, but it feels very true to the cruel spirit of the Empire. Vader calls them an abomination. But the ironic thing is, he’s something of an abomination himself. That’s not necessarily a connection everyone will get, but it’s there. I mentioned this last time, but Triple-Zero is a riot. The sheer notion of an “evil butler” type is hysterical. But when you put him amid the chaos of the Star Wars universe, next to a no-nonsense-type like Vader, the ensuing comedy feels very organic. I’ll try and stay spoiler-free here. But what Vader finds on the base is, at face value, very compelling. 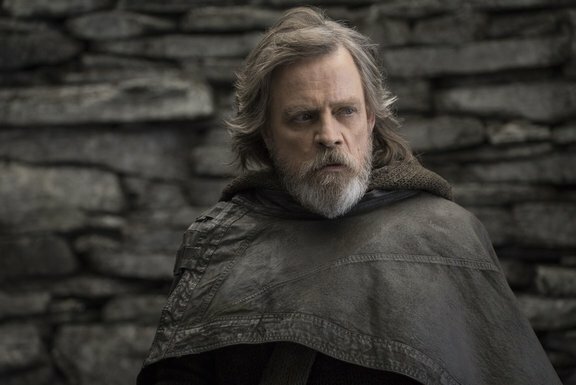 Gillen seems to be playing with the notion of the Jedi and Sith being an “ancient religion,” which was introduced in A New Hope. 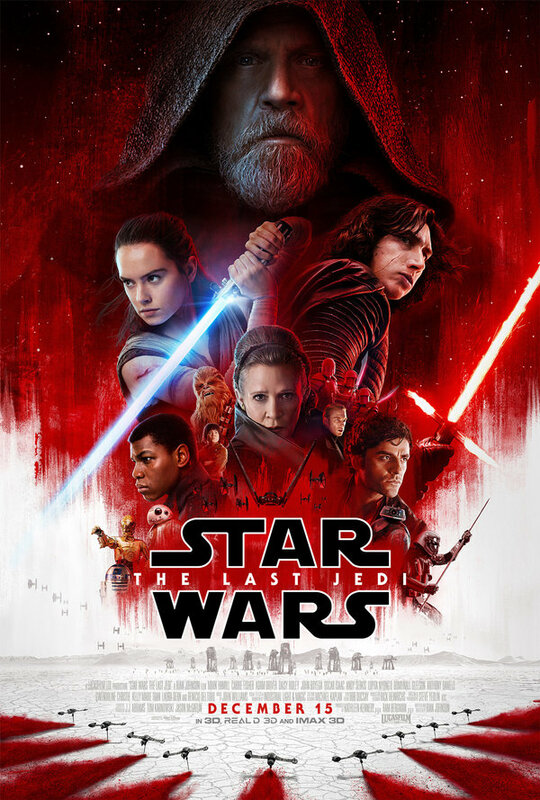 At one point, someone even says: “The Force is obsolete.” This is made all the more interesting when you consider this base is sanctioned by Palpatine, a Sith himself. From an in-story perspective, I question Palpatine’s motivations here. Is he truly preparing for a world without The Force? Or is this part of a larger scheme? I’m inclined to think the latter. 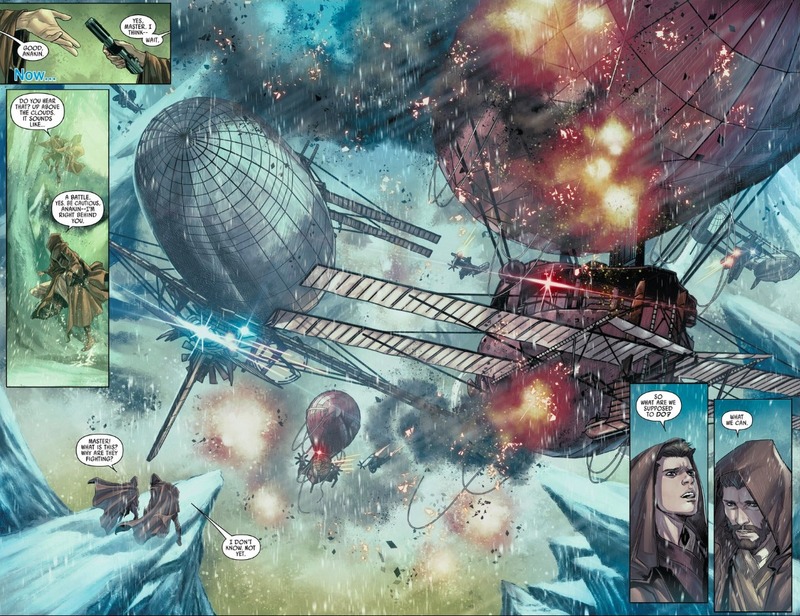 We don’t get a lot of time with Doctor Aphra in this issue. But what we do get is enough to keep me invested in her. Tragedy follows Darth Vader wherever he goes. And there’s little doubt that tragedy is what lays ahead for this woman. It’s simply a question of how, where, and when. But that’s simply one of many elements that makes this series a must-read for Star Wars fans. Images 1 and 2 from author’s collection. Image 3 from jedi-bibliothek.de. This entry was posted in Uncategorized and tagged Adi Granov, comic book reviews, comic books, Darth Vader, Darth Vader #5 (2015), Darth Vader #5 review, Darth Vader (Marvel Series), Doctor Aphra, Kieron Gillen, Marvel, Palpatine, Rob Siebert, Salvador Larroca, single issue reviews, Star Wars, Star Wars: Episode I - The Phantom Menace, Star Wars: Episode IV - A New Hope, Star Wars: The Force Awakens, Triple-Zero on 05/13/2015 by primaryignition. 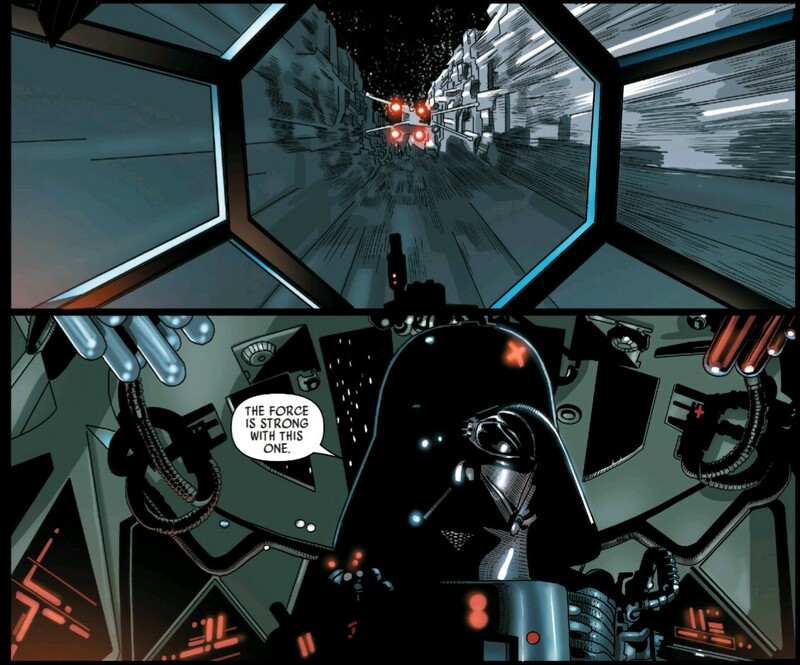 Star Wars: Darth Vader #1 made me understand what it’s like to be a Sith Lord. Or at least, it gave me a pretty powerful glimpse into what it’s like to be Anakin Skywalker inside that black suit. To say the very least, it’s not fun. 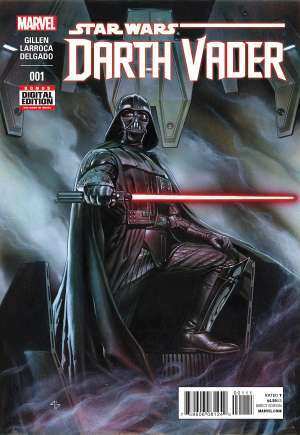 Following the events of Star Wars #1 and 2, Vader must once again face The Emperor as a failure. 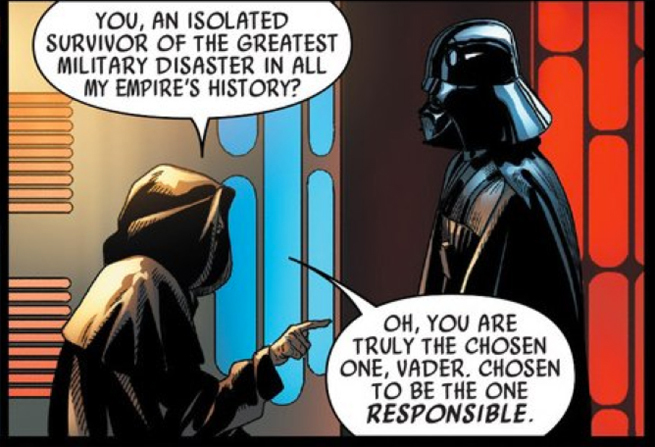 Palpatine blames him for the destruction of the Death Star, and also for allowing the Rebels to escape on Cymoon. Now, to find Luke Skywalker and the Rebel Alliance, Vader must ally himself with the likes of Jabba the Hutt and Boba Fett. Naturally, this brings him back to Tatooine, Anakin Skywalker’s home planet. The idea of Vader returning to Tatooine has been an intriguing one as far back as The Phantom Menace. But to my knowledge this is the first time we’ve actually seen it. It doesn’t disappoint, especially when we reach the end of the issue. However, much like Jason Aaron and John Cassaday in Star Wars #1, this issue relies quite a bit on the nostalgia factor to draw readers in. But while Star Wars #1 picked both lines and certain imagery from the original trilogy, this issue plays with actual shots and sets from both A New Hope and Return of the Jedi. 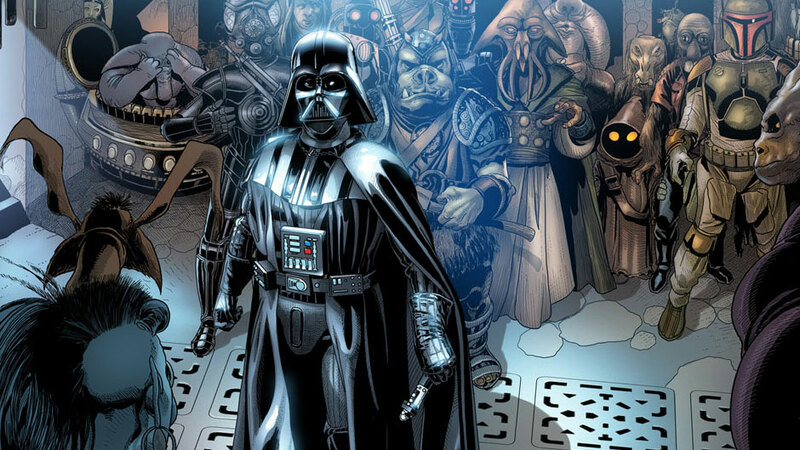 The image of Darth Vader entering Jabba’s palace, dealing with the guards and Bib Fortuna, and then standing there amongst his cronies is obviously an alternate take on Luke’s entrance from Jedi. Later, Larroca essentially pencils screen caps from A New Hope to provide us with a flashback page. 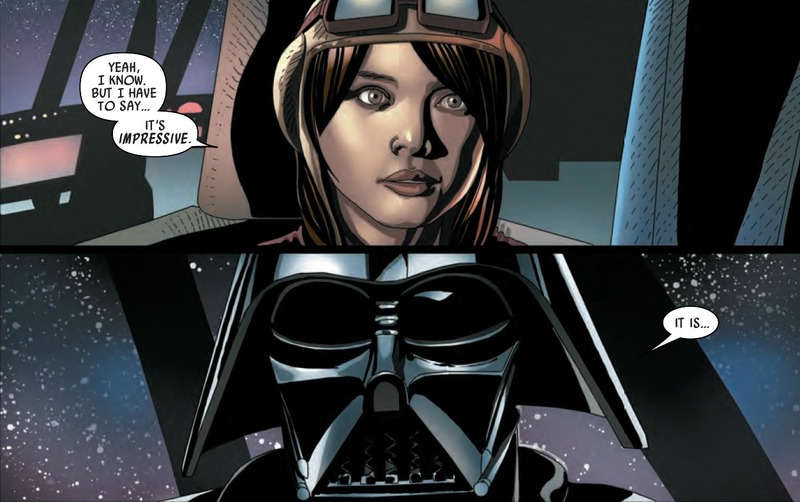 One can argue than in terms of relying on nostalgia appeal to cheaply hook readers in, Star Wars: Darth Vader #1 is an even bigger offender than Star Wars #1. So with that in mind, why is the former a good issue, while the latter is a bad one? For my money, it’s all in the way the issue was written. 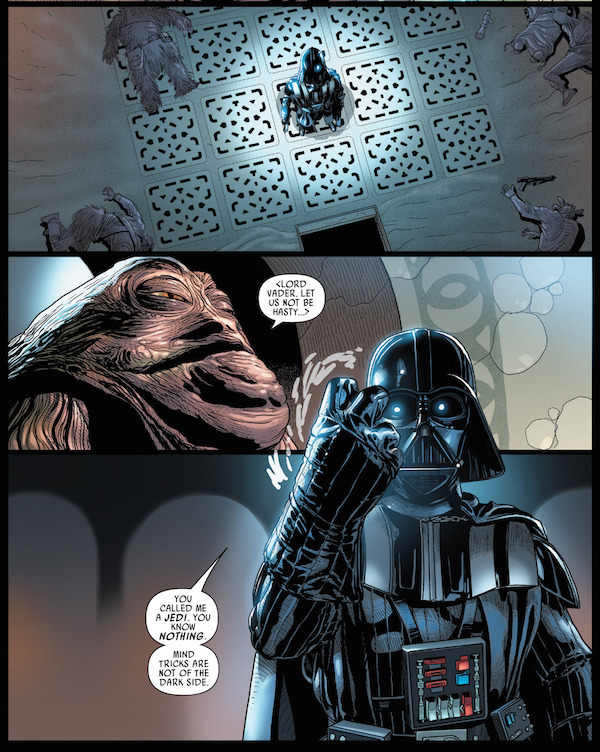 Darth Vader #1 draws you in with the notion that Vader will be journeying into Jabba’s lair, just as Luke will later do, using very specific images and shot from Jedi. But the real hook comes when Vader and Jabba start talking. Vader refuses to address Jabba by name, simply calling him “Hutt,” like he’s merely vermin. When Jabba tries to exercise his own power, Vader retaliates, at one point choking Jabba with the Force. Through this scene, we not only get a sense of how little regard Vader has for life, but how his hatred and anger are always with him. They are not a temporary state of being. They are his very existence. We also get a scene with Palpatine, where we see that despite Vader’s ever-present anger, it still hasn’t brought him the power he seeks. He is still a servant of the Emperor. Or as Palpatine says: “A blunt instrument far better to be wielded than to wield.” He then places Vader under the thumb of one of the Imperial commanders we briefly saw in A New Hope (prompting one of those screen cap flashbacks), and deliberately hides the identity of a new ally. We later close on a familiar, yet ever so dramatic two-page spread. 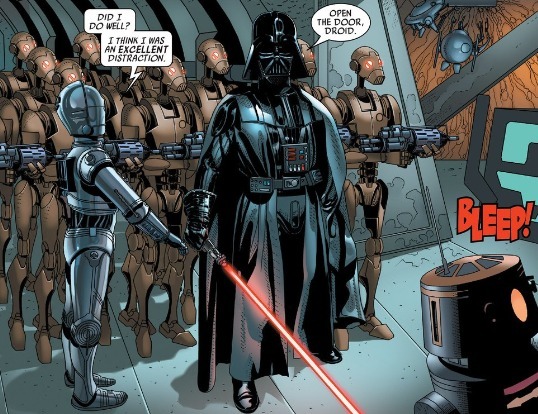 Star Wars: Darth Vader #1 is essentially a look at what Vader’s life is like in the aftermath of the original film. 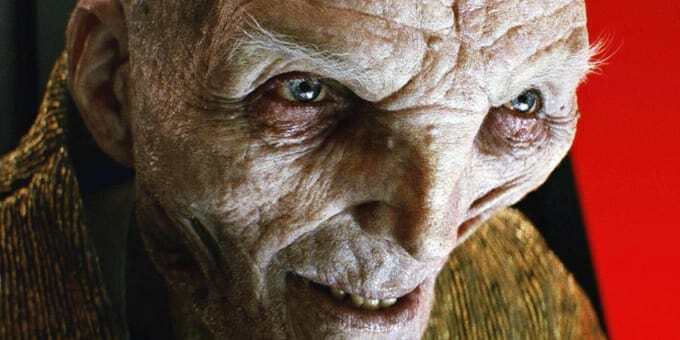 He is still a man that has lost everything but his hate and his lust for power, which he will presumably never have so long as he is under Palpatine’s influence. Thus, he takes that hate out on the terrified life forms around him. That’s the message we’re meant to take away from this issue. And it’s an important one about our main character. We got there using plenty of flash and flare from the original trilogy, but in this instance the end justified the means. Star Wars #1, on the other hand, used that same nostalgia, flash, and flare as the destination. Cassaday’s art was fantastic, as always. 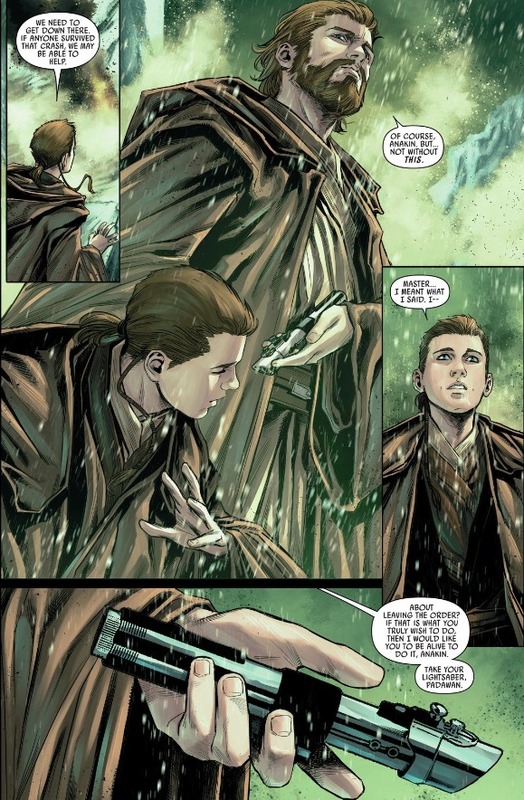 But despite the cool escape story, which is very Star Wars, the issue lacked soul, and felt largely empty. That’s the difference between the Aaron/Cassaday issue, and the Gillen/Larroca issue. I’m very interested to see how much the prequel material is acknowledged, not just in this book, but in all of Marvel’s Star Wars comics. The ending of this issue is a pretty heavy callback to Attack of the Clones. The Force Awakens gets closer every day, and the Disney/Lucasfilm strategy seems to be getting us to refocus on classic Star Wars stuff. 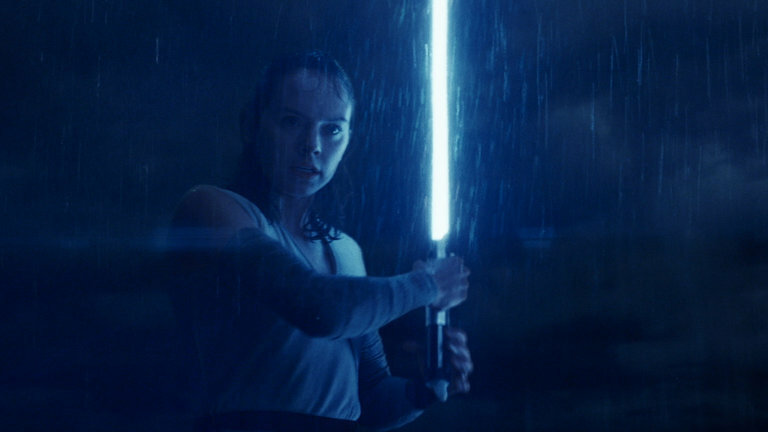 This makes sense, as we’re getting ready for Luke, Leia, and Han to return. It also seems like they’re trying to gloss over the prequels, which also makes sense, given how poorly they were received by many. It’s something to keep an eye on as we move closer to December. 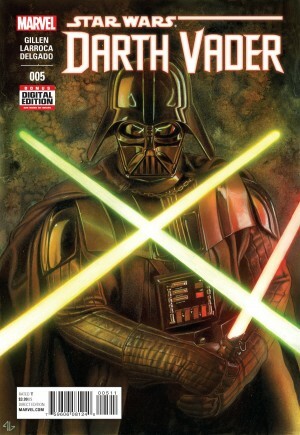 Star Wars: Darth Vader was one of the best single issues of a Star Wars series that I’ve read in quite some time. It’s definitely an issue worthy of its iconic title character. Image 1 from popmatters.com. Image 2 from marvel.com. Image 3 from comicbook.com. Image 4 from page45.com. 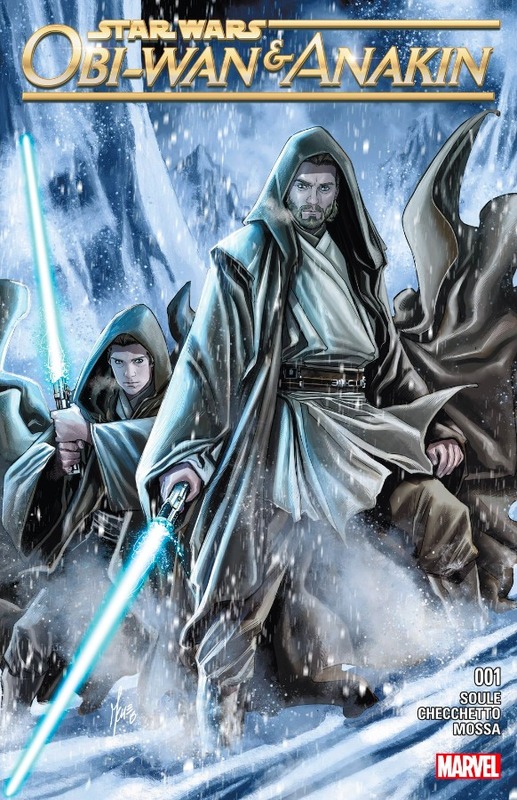 This entry was posted in Comic Books/Graphic Novels and tagged Anakin Skywalker, comic books, Darth Vader, Darth Vader #1 (2015), Jabba the Hutt, Jason Aaron, John Cassaday, Kieron Gillen, Marvel, Palpatine, Salvador Larroca, single issue reviews, Star Wars, Star Wars #1 (2015), Star Wars prequels, Star Wars: Episode I - The Phantom Menace, Star Wars: Episode IV - A New Hope, Star Wars: Episode VI - Return of the Jedi, Tatooine on 02/17/2015 by primaryignition.